At the outset of this post, I want to be clear that I am not simple-mindedly spinning increased atmospheric CO2 as a net positive for plants. Growth-spurring impacts of excess atmospheric CO2 are not uniform by plant type, and certainly plant growth will be limited by other factors. However, evidence is mounting that, for some terrestrial plants, trees in particular, growth is currently being spurred by increased atmospheric CO2, and/or by wetter growing seasons. For example, the Telegraph reports on a study published in the peer-reviewed scientific journal Nature that Trees are growing faster and could buy time to halt global warming Read on for details, and evidence of negative secondary and tertiary impacts, as well. To view an abstract of the original research paper in Nature, go to this link for Increasing carbon storage in intact African tropical forests. CO2-stimulated plant growth is accelerating both negative and positive impacts of the "Greehouse Effect"
Grasses and shrubs become more luxuriant or widespread due to increased CO2 and weather changes, particularly in desert regions of Africa and Asia which formerly had been strong sources of wind-borne atmospheric dust (as pictured). 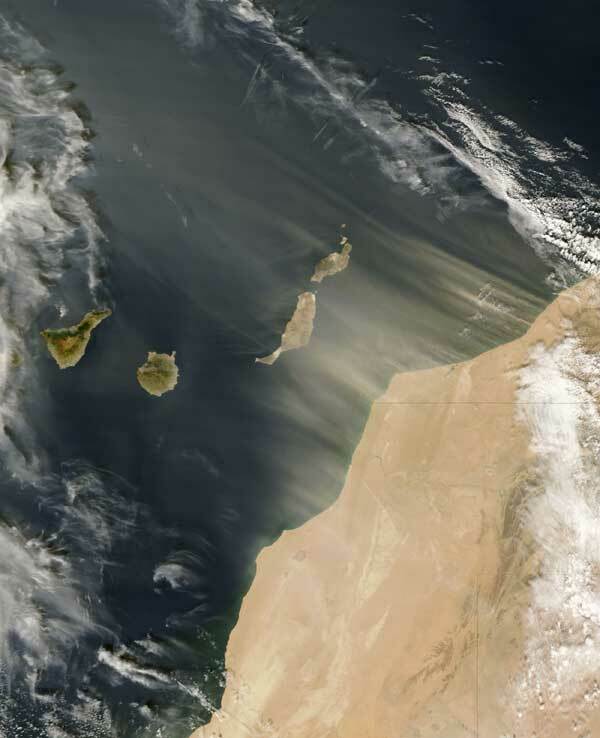 Pre-1980 wind-eroded dusts from North East Africa lofted large volumes of soil particles over the Atlantic Ocean. Those dust particles strongly influenced climate by reflecting skyward a good amount of the sun's incoming solar radiation. With the potential for wind erosion apparently reduced since the late 1970's, atmospheric dust load over the oceans has been reduced, and more heat is being absorbed on the earth. One potential result of that heat flux increase is more energy in play for hurricane development. That is one of the human impact dimensions referred to in the headline. A new study reported Thursday finds that lessening airborne dust has caused a rapid warming of the tropical North Atlantic in recent decades. The sun-dimming dust, blown in from sandstorms in the Sahara or caused by volcanic eruptions, reflects a portion of the sun's rays back into space. This decline in dust was responsible for 70 percent of the warming in the Atlantic since the early 1980s, according to the study...In previous decades "there was much more dust blowing from (Africa) onto the Atlantic and cooling the sea and ... potentially suppressing hurricane intensity," he said during an interview with Reuters. My goal for this post is to get a public discourse started on impacts related to this issue. Politicians scientists, and citizens need to understand what is at stake. Examples of how this feeds into government policy choices are readily found. Here's one I find particularly important. Less dust-fall onto the ocean surface means a loss of sufficient trace minerals in surface waters to support previously "normal" levels of marine plankton growth. Replenishment of iron to return and restore plankton growth is what "iron seeding" is all about. By stimulating plankton growth, CO2 is incorporated in biomass, reducing ocean acidity and potentially sequestering carbon from the atmosphere, either by the food chain drawing it up into whales or by plankton precipitating into marine sediments. Opponents to iron seeding have incorrectly argued that iron addition is somehow unnatural and gone on to make what are fundamentally ethical (and unscientific) arguments against iron seeding. For details see the archival post:- Anti-Science Environmentalism: Iron Seeding Experiment Protested...Again Currently, the International Maritime Organization, a UN-sponsored agency, is on record as opposing iron seeding research in the high seas. What about the ecological dimension? Here follows but one example. Russ George of Planktos-Science, a long-time proponent of iron seeding, points out the implication for marine fisheries in his post on Environmental Research Web. The reported loss of Africa dust,, while having temperature influence on the Atlantic, has a far more dire and immediate consequence. The same series of satellite data used by these climate modelers has shown a more than 26% decline in net primary productivity of the Atlantic, read as the forced extinction of green plants, the phytoplankton. This massive loss of ocean plankton has staggering effects up and down the food chain, destabilizing the Atlantic ecosystem. One of its most damaging effects is in the role in destruction of Atlantic fish stocks. While it is fashionable and politically correct to point fingers for fisheries declines only at the bad fishers, the loss of ocean pasture capacity is worse. Further, those fish were not mere farm animals awaiting slaughter; they are, or were, the worms of the surface ocean whose toil of life churned ocean nutrients, greatly enriching those ocean pastures. As we starve and remove the worms, fish and other marine life of the seas, we destroy the ecosystem. The same data series that shows the decline in African dust also shows that decline is due to greening of the grassy regions of N. Africa which are made greener by the massive dose of CO2 we've emitted over the past century. That dose of CO2 now in the air, a deadly airborne carbon bomb, will remain for centuries even if were to never emit another molecule of CO2, which of course isn't going to stop. Certainly, other ecological impacts are happening. There are more than enough variables and feed-back loops in the above to set heads spinning. So, although comments and critiques on the preceding discussion are certainly appreciated, I want to move on, now, to the realm of religion and lobbyists. Where do opponents to climate action stand? Professional climate skeptics or "deniers," as I prefer to call them, mostly base their opposition to government sponsored climate action by claiming uncertainty exists regarding what climate processes are most significant, or by citing inflated negative economic impacts of taking action while ignoring the positive impacts of doing something constructive. Aside from that, one (but not the only) religious view taken to oppose government sponsored climate action springs from a belief that only God the creator of Earth is capable of changing it at planetary scale; hence the argument that mankind is significantly altering it is rejected out of hand. Atmospheric CO2 is the immediately critical factor - not climate change per se. Competitive Enterprise Institute is going to have to move fast to head this one off at the peak. More archive posts on impacts of atmospheric CO2 levels. At the outset of this post, I want to be clear that I am not simple-mindedly spinning increased atmospheric CO2 as a net positive for plants.